As the housing market starts improving the supply and demand will shift towards seller’s market. This means multiple offers on a same property and the chances of your offer getting accepted may not be as great as it used to be in the buyer’s market. Here at USA Mortgage we strive to not only provide our clients the best service but also make sure our clients have all the tools and resources necessary to get their dream home. Need to grab a quick quote? Certified Preapproved Homebuyer will guarantee the sellers $5,000 if we fail to close the loan which is a great way to stand out when submitting your offer. We process and underwrite your loan as you’re shopping for your home. 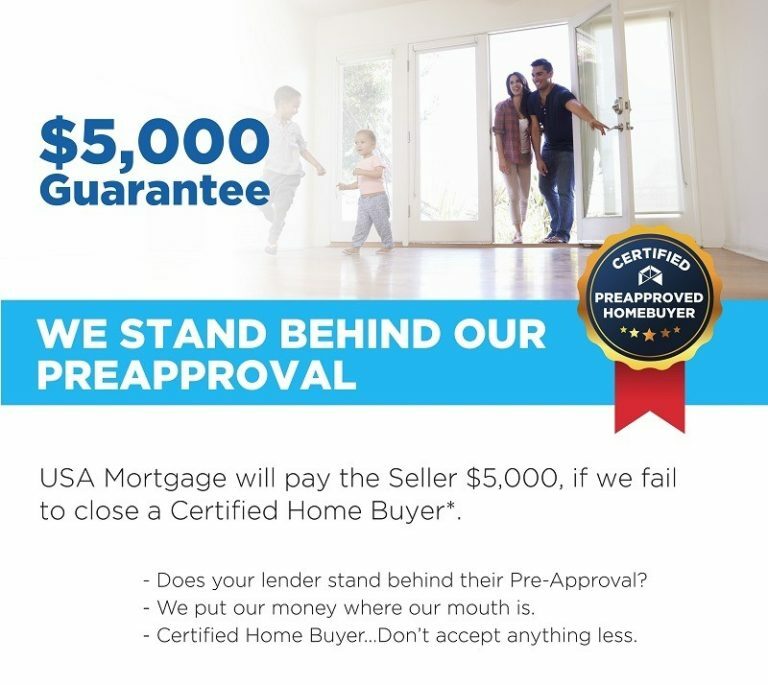 USA Mortgage will provide a certificate of preapproval with the $5,000 guarantee. You can add the certificate to your offer with the flyer explaining the option. Call or email one of our loan officers today for more details.